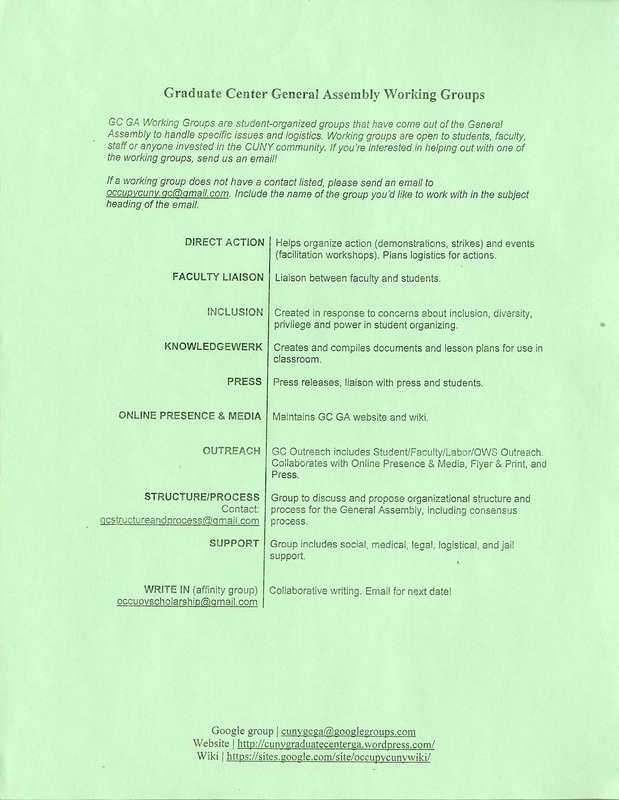 Informational leaflet with a list of Graduate Center General Assembly Working Groups for Fall 2011: direct action, faculty liaison, inclusion, knowledgewerk, press, online presence & media, outreach, structure/process, support, and write in. The Graduate Center General Assembly was an ad-hoc group of Graduate Center students, teachers, and staff who worked together to connect the ideas and activities of Occupy Wall Street to the Graduate Center, CUNY, and beyond. The GC GA began in Fall 2011, and its participants continue related activities to this day, even as the GC GA no longer meets. Cite This document | Graduate Center General Assembly, “Graduate Center General Assembly Working Groups,” CUNY Digital History Archive, accessed April 24, 2019, http://cdha.cuny.edu/items/show/6682.